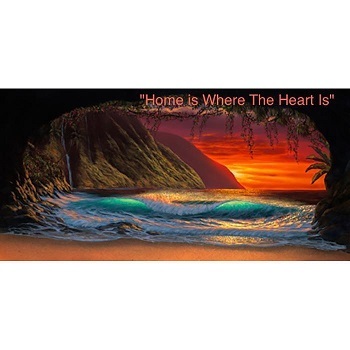 Based on the world famous Napali coast, "Home is Where The Heart Is" showcases the intimate coast line during the artists favorite time of the day, sunset. The cave represents home and the colors of the sunset represent love. Two of the most important things in life for anybody. This has been the artists signature series and is the last one available in a sold out edition.